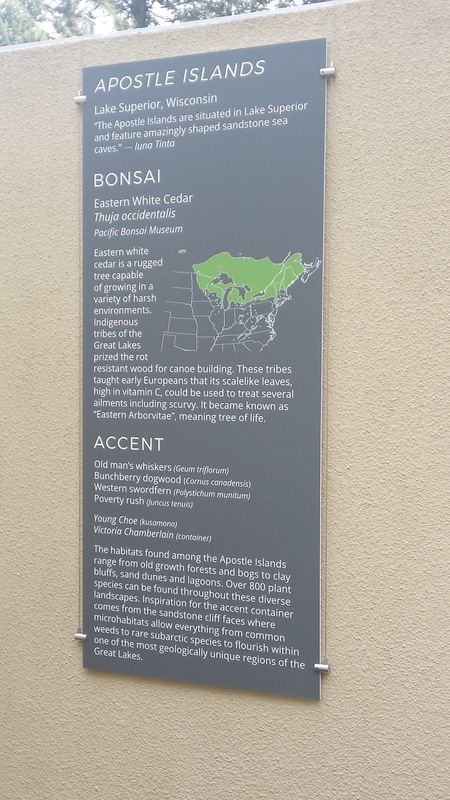 The "Natives" exhibit focused on North American native species in bonsai (as opposed to the Japanese species which are ubiquitously present in the American bonsai community). 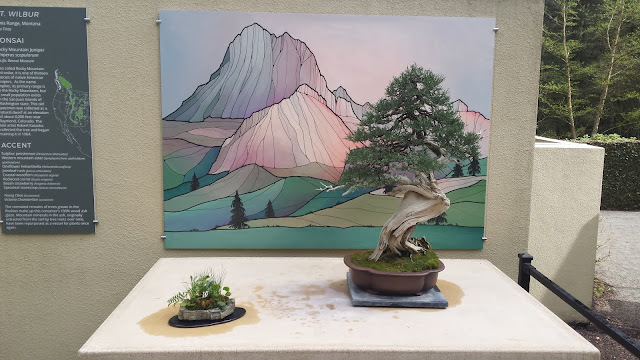 Aside from the species of plant, the exhibit also had other exciting ways in which it broke from traditional Japanese bonsai. Three-point displays are one traditional form of bonsai display which typically includes a scroll - often depicting a special Japanese symbol, accent plants (kusamono) or viewing stones (suiseki), and the bonsai tree itself with some sort of stand; these traditional display compositions are intended to extend the story of the tree - to describe a location or time of year for example. 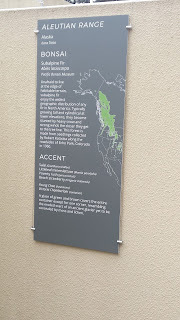 The "Natives" exhibit breaks away from the Japanese mold of three point display by replacing the customary small scrolls are replaced here with grand paintings of American landscapes by Iuna Tinta. 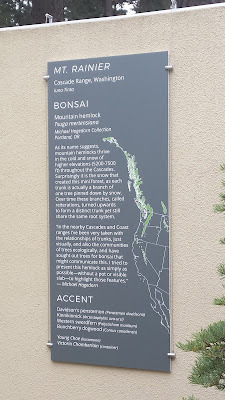 Accents plants are still included for each tree, but the ceramist behind each container composed them specifically with North America in mind. 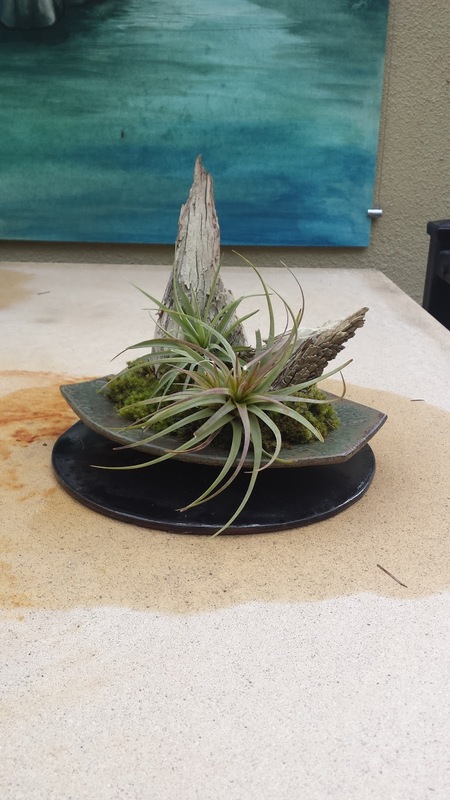 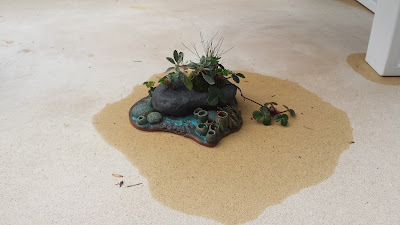 Using custom ingredients often physically from the environment such as volcanic ash, Vicki Chamberlin made impressive containers for each accent plant. The containers often blended so well with their intended environment that I was amazed and had to be reminded the containers were in fact ceramic. 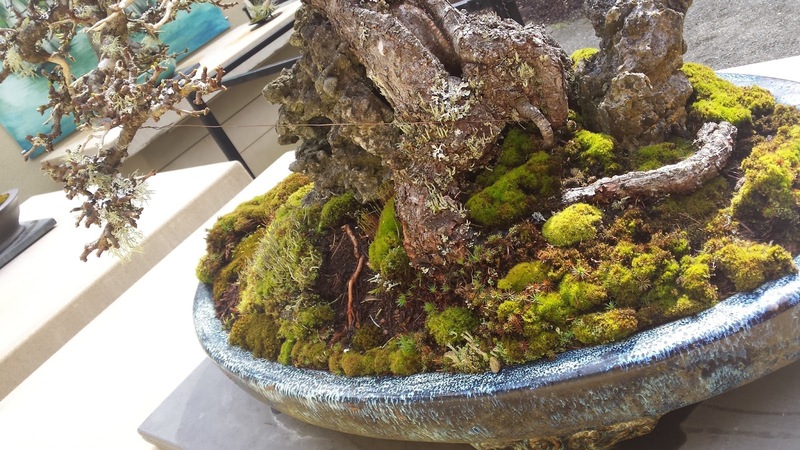 Hopefully for all us bonsai enthusiasts, Vicki extends her talents to making full-size bonsai pots in the near future. 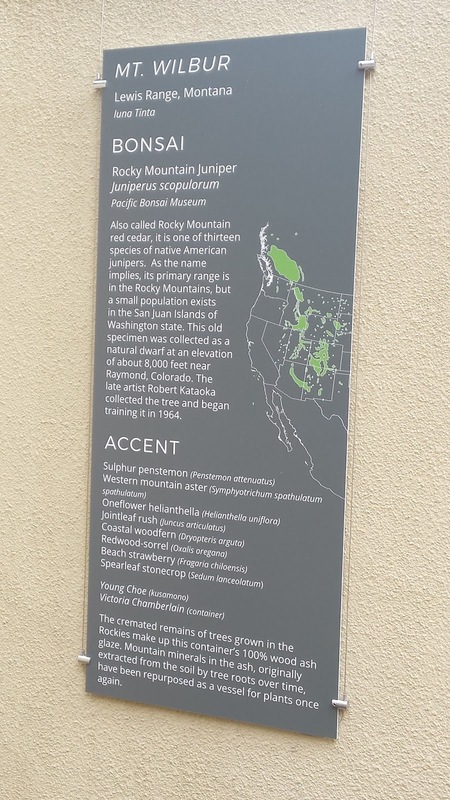 The accent plants were also completely composed of native species from each environment by Young Choe. 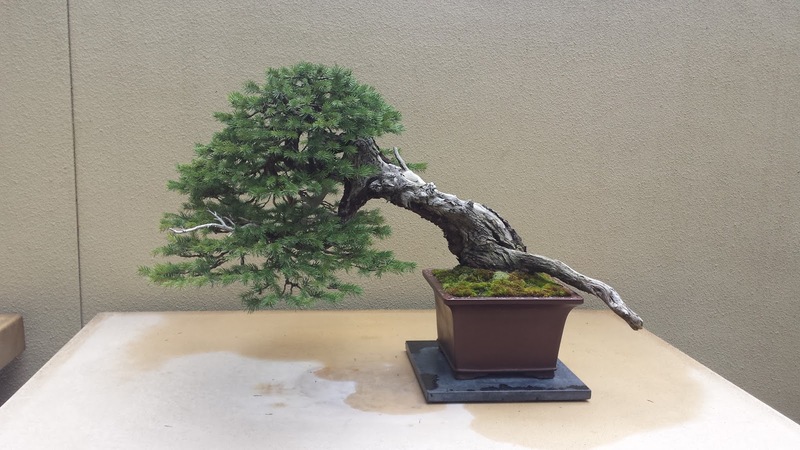 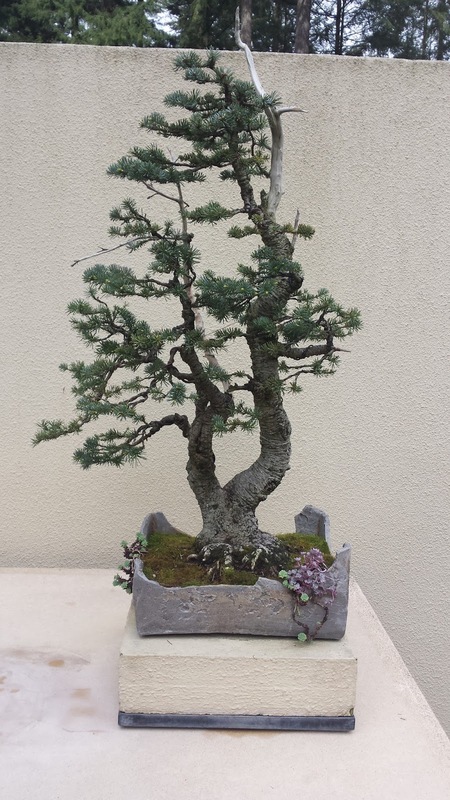 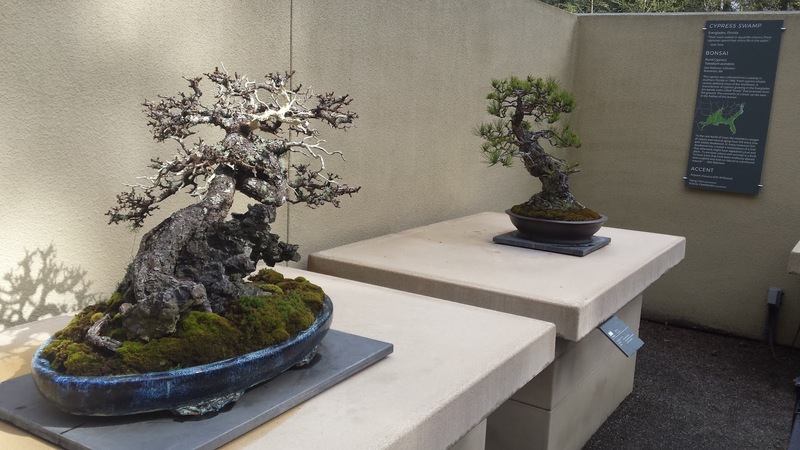 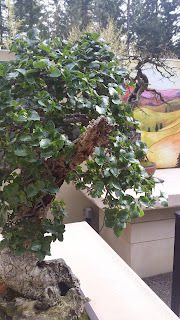 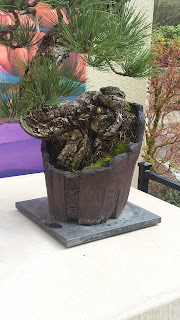 For those of you interested, kusamono can be an art in and of itself separate from bonsai! 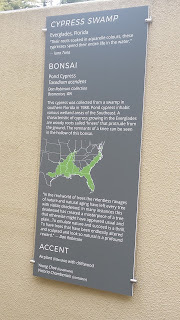 I have seen if it! 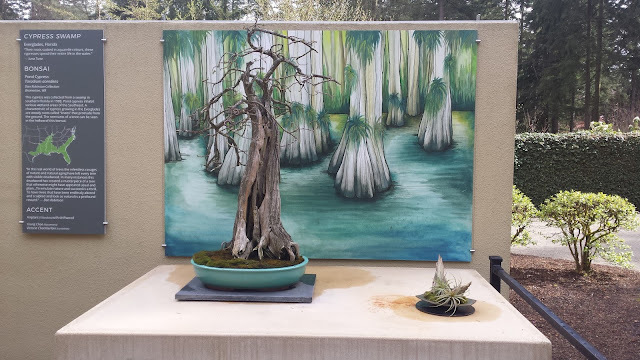 Aarin Packard, the museum curator, had an initial idea for the "Natives" exhibit to physically move collected and cultivated bonsai back into their natural, wild environments and compose a picture with the backdrop of a wild landscape vista and whatever accent plants or viewing stones happen to be around for the impromptu compositions. 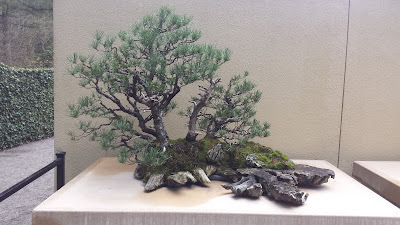 Although that idea may not have been feasible to bring the product back into the museum setting, I still find it to be a promising idea; hopefully, someone in the bonsai community will undertake the original idea someday. 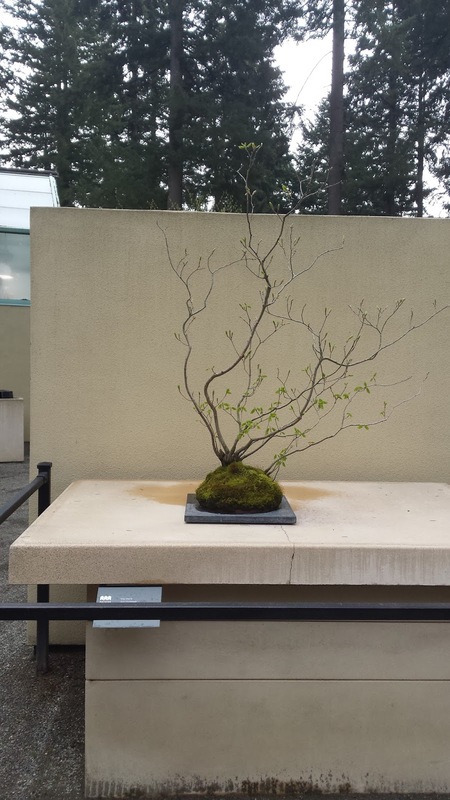 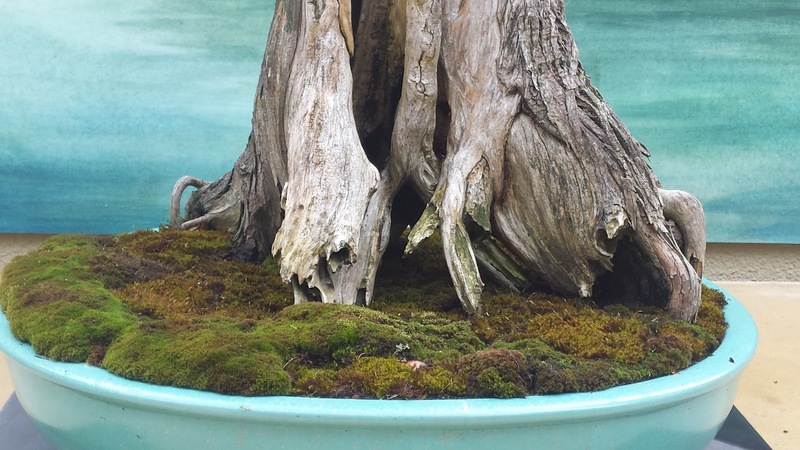 A Dan Robinson collected and styled Alaska yellow cedar (recently discussed in this post) planted on a lava rock. 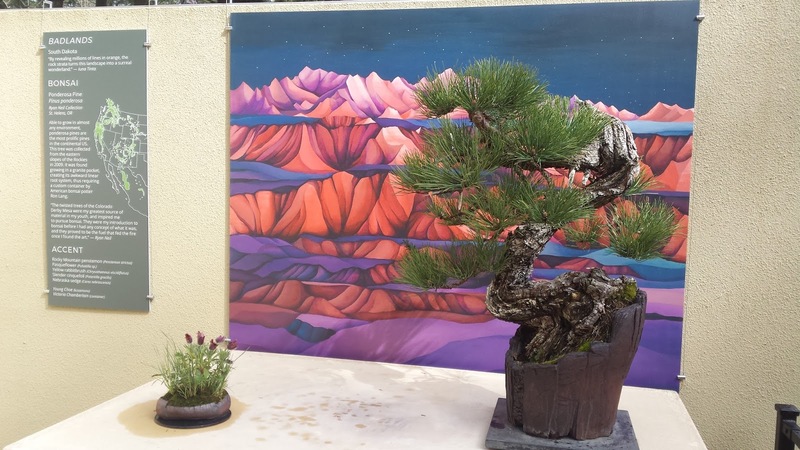 The painting is intended to depict the volcanic mountain ranges without actually painting the mountain. Dan's Alaska yellow cedar caption. Click any image to zoom! 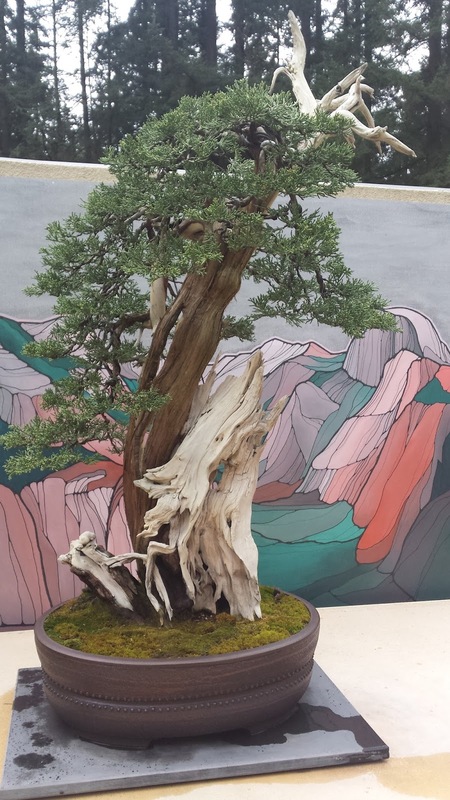 A Sierra juniper (Juniperus occidentalis) from the museum's collection with Yosemite depicted in its backdrop. 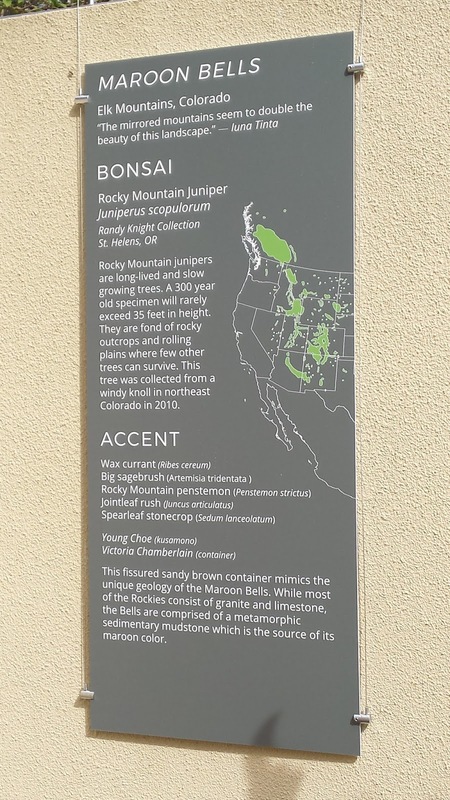 I seem to have failed to take a close up of the accent container, but it captured a granitic rock look with a convincing glaze! 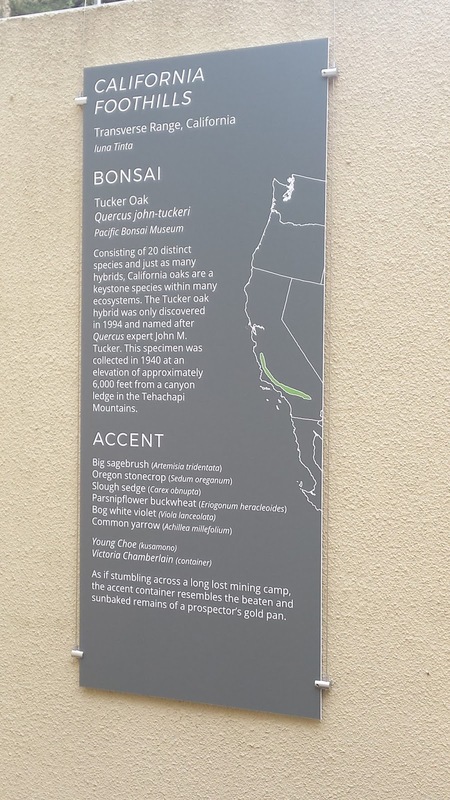 The posted caption for the Sierra juniper. 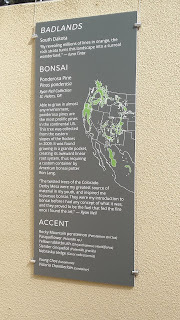 A white fir from the Museum's collection(Abies concolor). Pacific Bonsai Museum collection Western hemlock (Tsuga heterophylla). 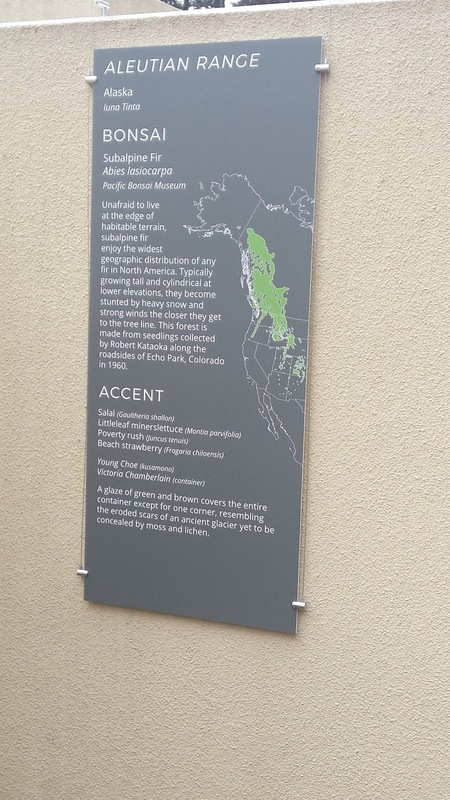 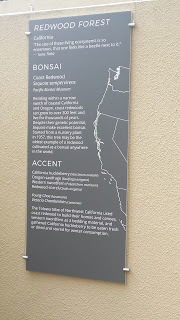 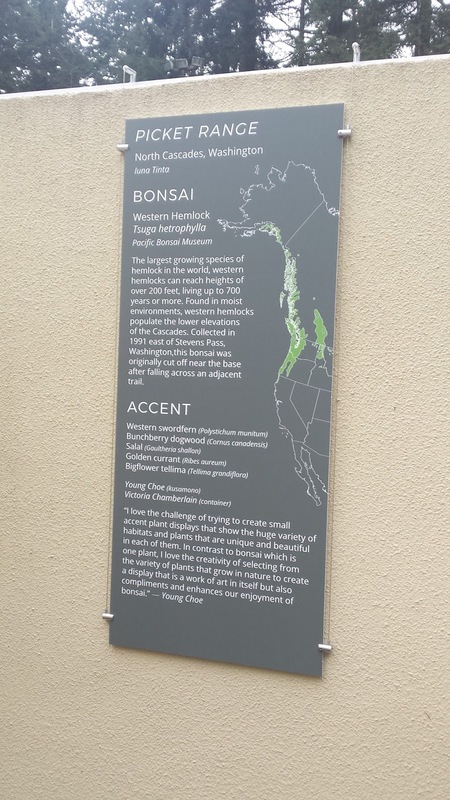 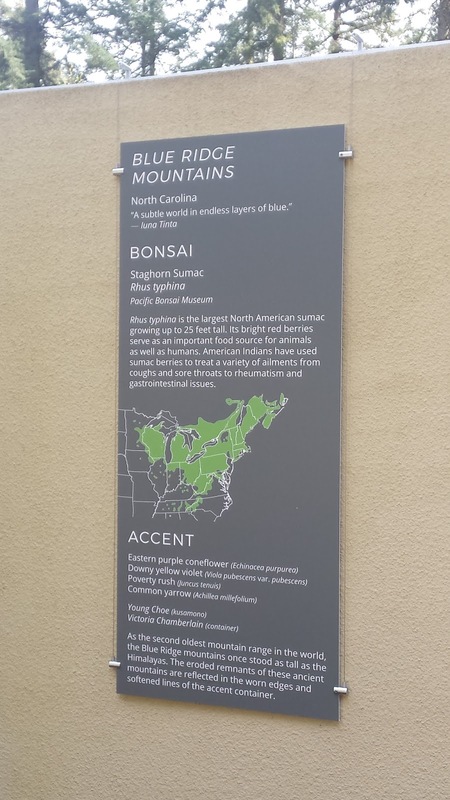 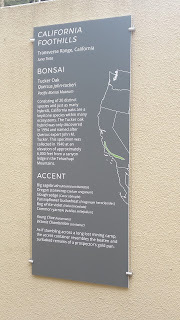 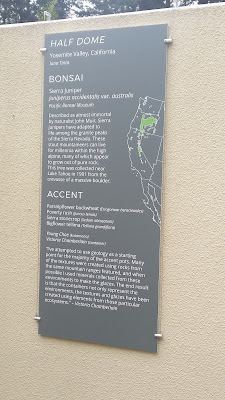 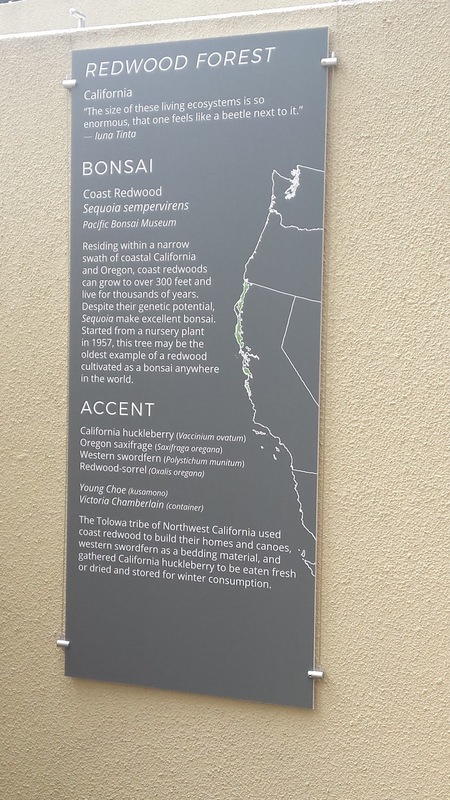 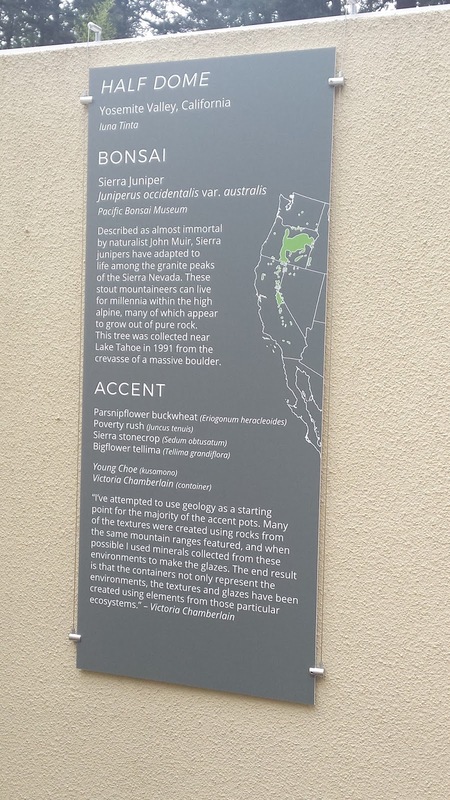 Description for the museum's Western hemlock. 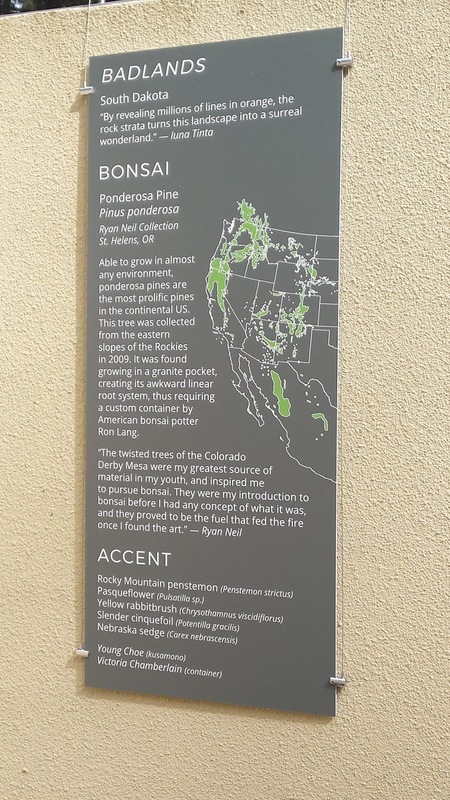 A tree of unidentified origin by my memory (possibly from Scott Elser). 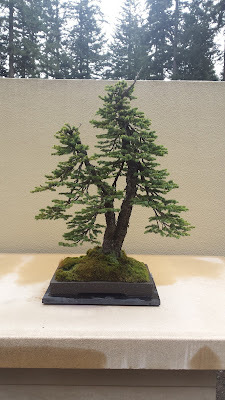 It is a Sitka spruce (Picea sitchensis), also native to our forests. A Pacific Bonsai Museum collection subalpine fir (Abies lasiocarpa) forest planting. 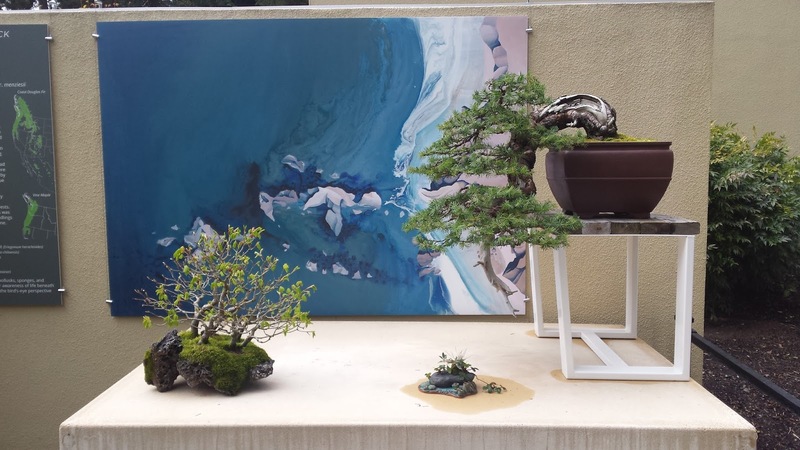 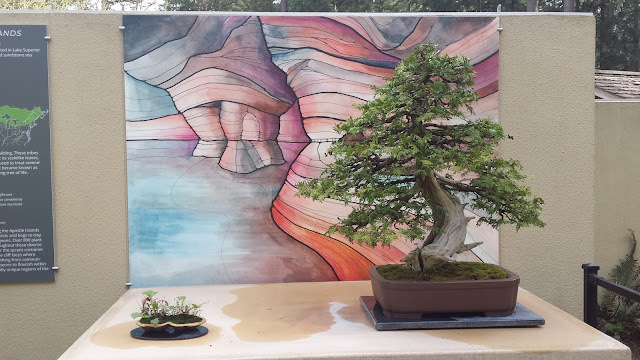 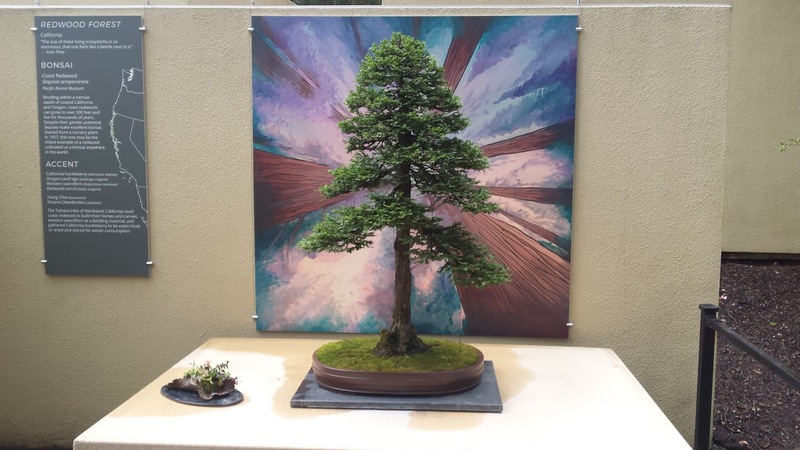 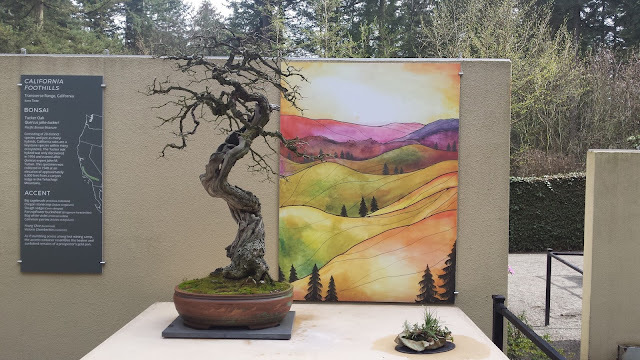 This tree from Scott Elser is actually a four-point display between the main bonsai (Douglas fir, Pseudotsuga menziesii), a vine maple accent tree, a kusamono accent plant, and the painting of coastal Oregon. 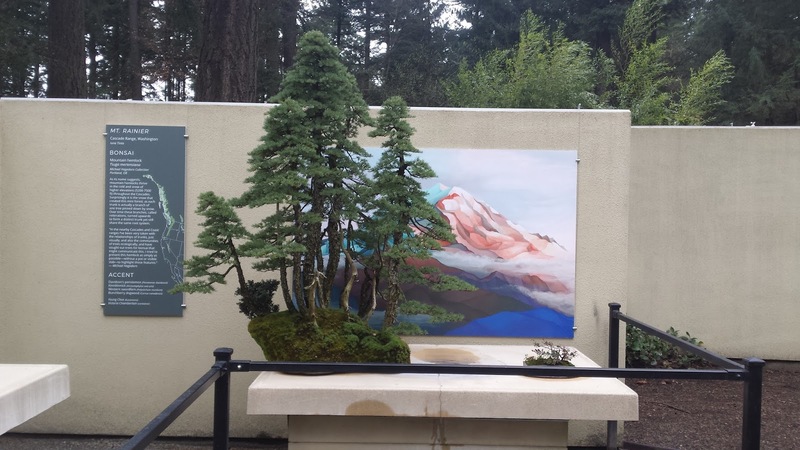 Another Sitka spruce on loan from Scott Elser, collected by Randy Knight. 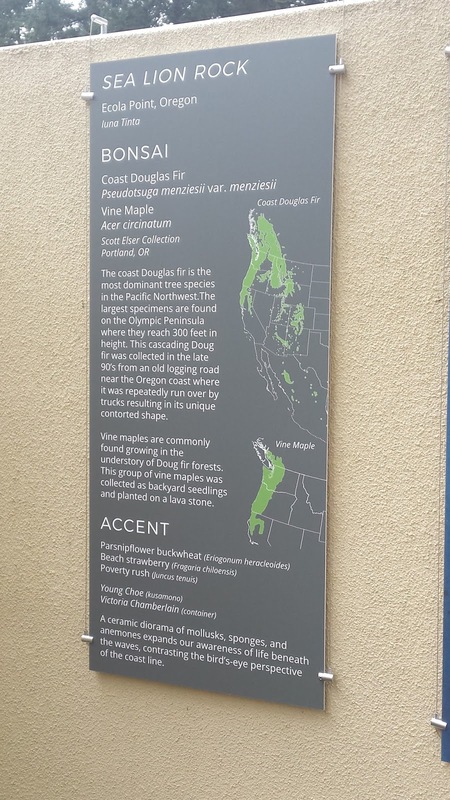 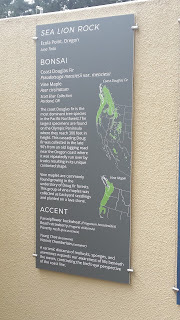 The Scott Elser Douglas fir placard. A coastal redwood (Sequoia sempervirens) formal upright also from the Pacific Bonsai Museum collection. 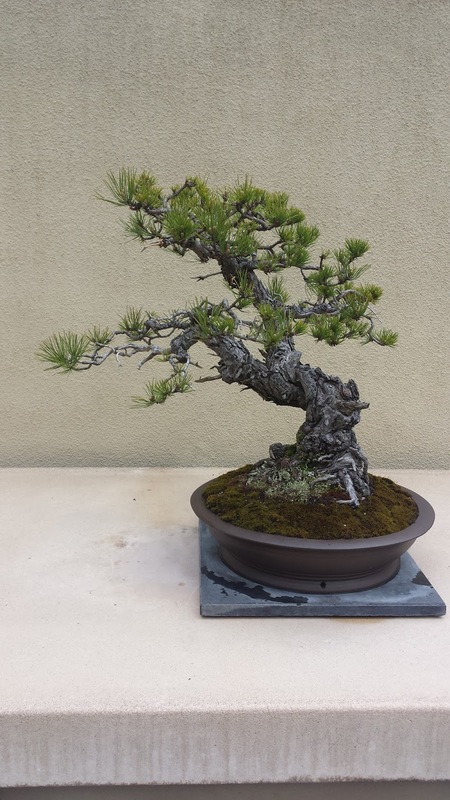 This pine group planting on a cedar slap caught my interest. 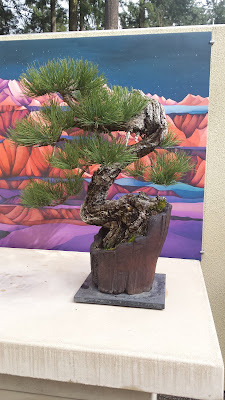 Shore pine (Pinus contorta) from the museum's collection. that I recently posted about. 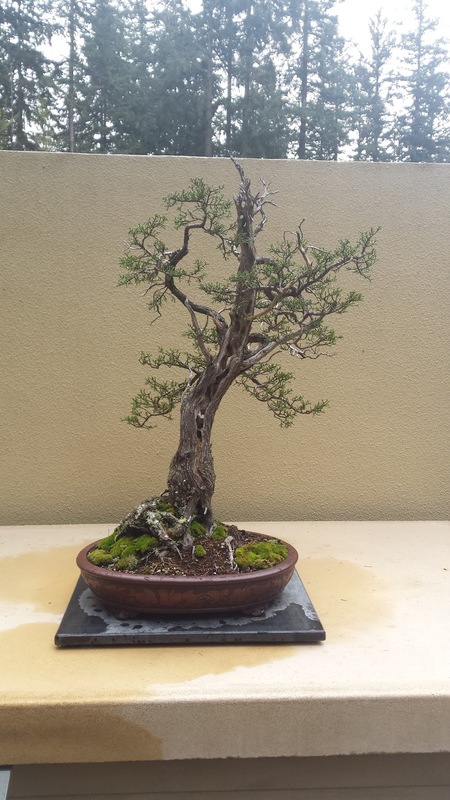 Another Sierra juniper, this time from Randy Knight. Another angle of the tree. 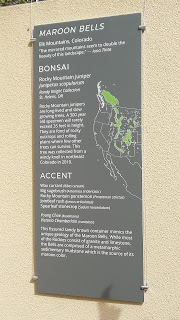 Description of the Randy Knight Sierra juniper. 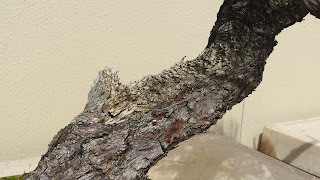 Closeup of a deadwood feature on a nearby ponderosa pine. A Ryan Neil ponderosa pine (Pinus ponderosa). Notice the pot - it reminded me of a barrel. 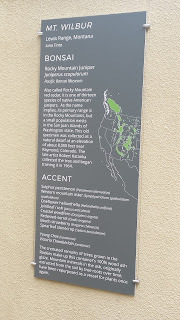 Also, contrary to the impression it left on some, the painting is not intended to depict the Painted Hills of Oregon. 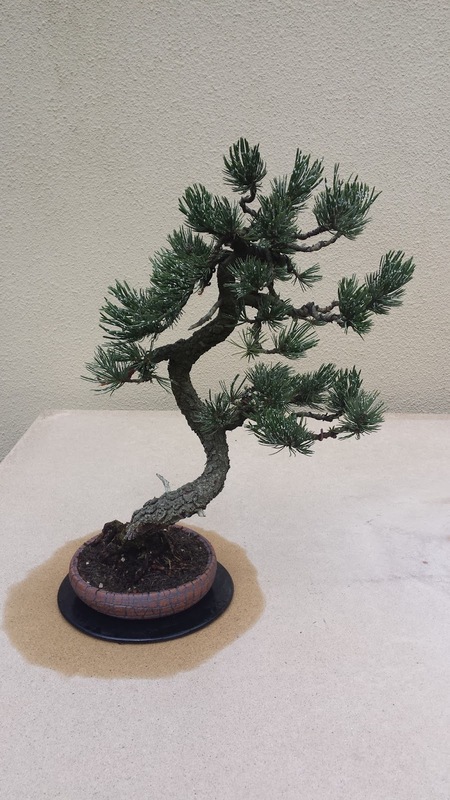 Possibly a Randy Knight tree. permanent place in the collection. 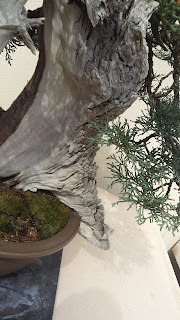 A Rocky Mountain juniper (Juniperus scopulorum) from the Pacific Bonsai Museum's collection. A bristlecone pine bonsai from the museum's collection. 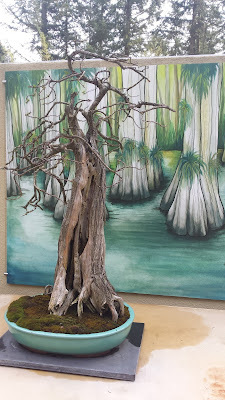 A subalpine fir from the museum collection. A Tucker's Oak from the Pacific Bonsai Museum's collection and originally collected from California. 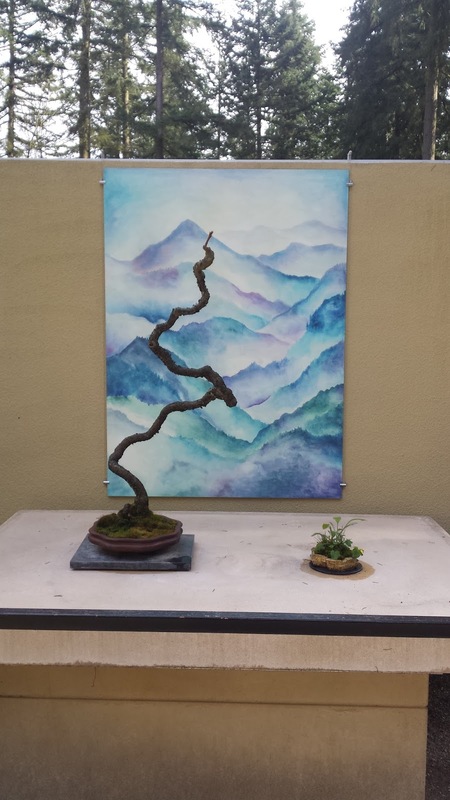 I especially like the composition with this tree as the painting evokes images of the California farmlands and vineyards. 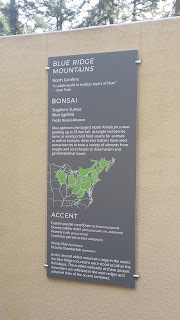 beyond me. 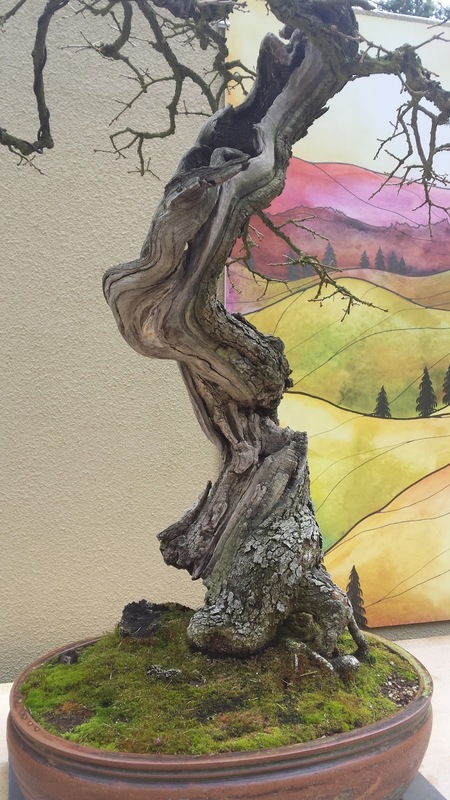 I love it (I'm a hoe for quality deadwood). 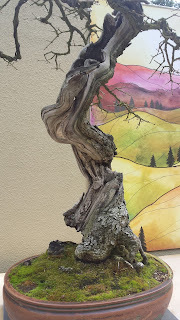 Deadwood on a California scrub oak by Henry Hirao. 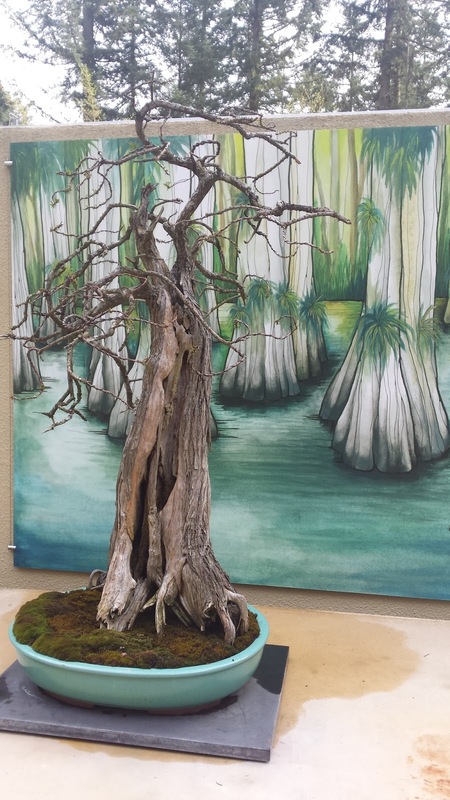 A Dan Robinson bald cypress (Taxodium distichum from this recent post) styled after the most ancient and damaged trees from southern swamps. 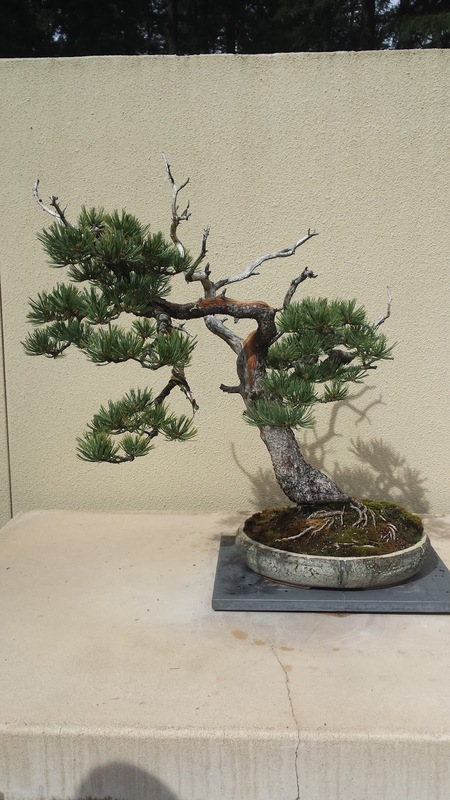 This Dan Robinson pitch pine was also featured in a recent post. 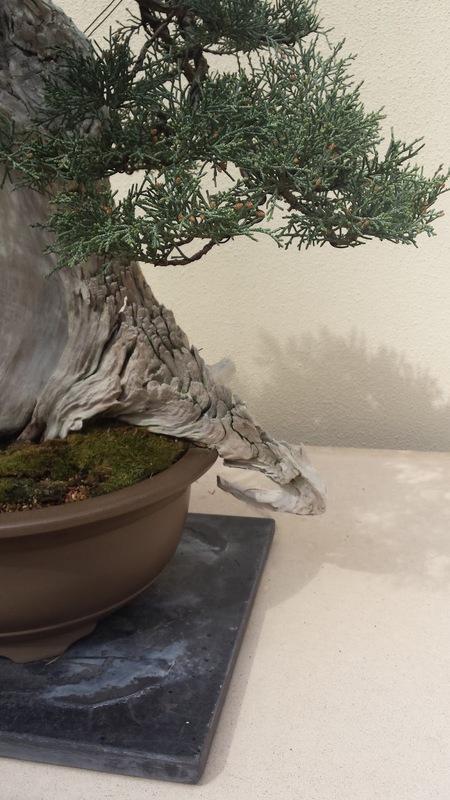 Imagine exploring the crevices and roots of a full-sized version of this tree. 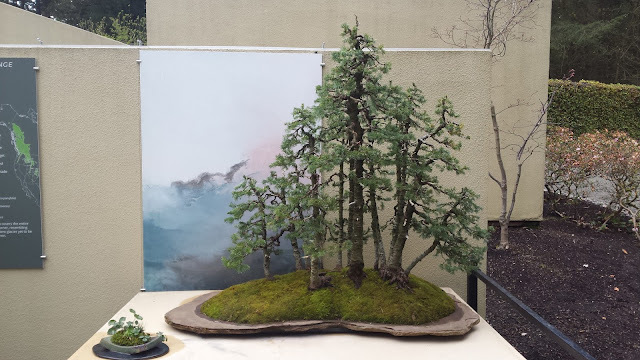 Some alternate angles on previously discussed Dan Robinson trees. This is the surface root I discussed in the preparation article on this tree. 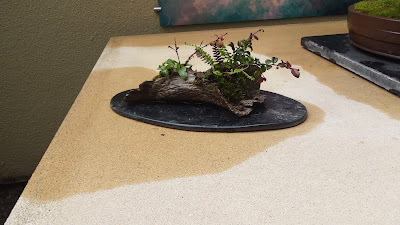 by a layer of tall moss. An Eastern white cedar (Thuja occidentalis) from the Pacific Bonsai Museum's collection. 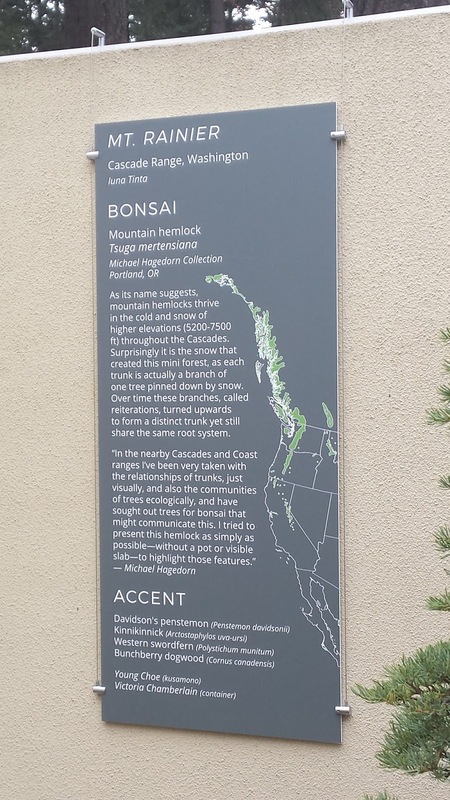 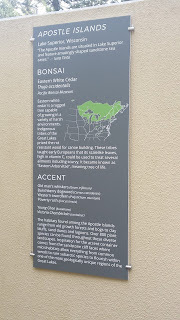 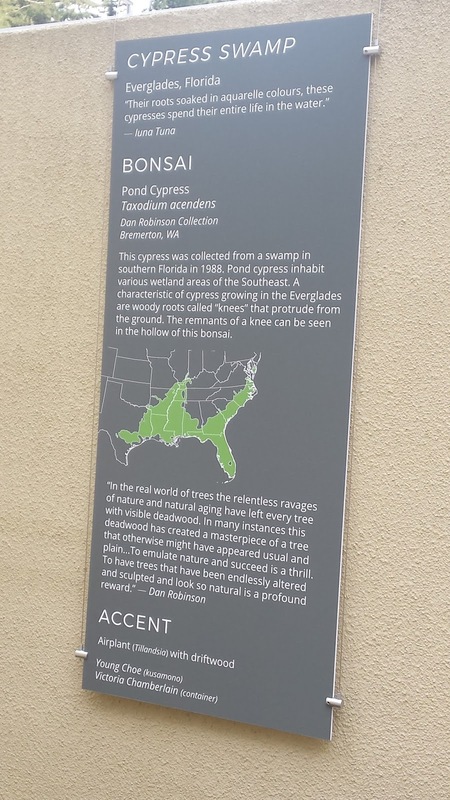 The Eastern white cedar's information. 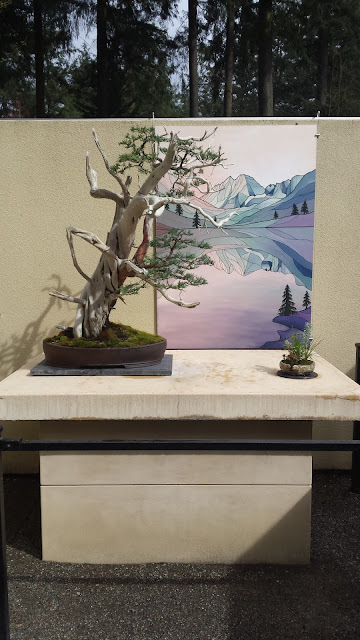 This was one of my favorite trees among those with paintings. The tree itself is highly unusual and has little substance to it in the winter months, but when combined with other components, the display is much more artistically entertaining to view than the tree alone. I am curious what you all thought of these displays, whether established bonsai artists, laymen viewers, Japanese traditionalists, or whatever you happen to be. 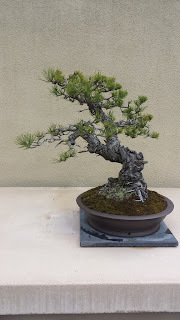 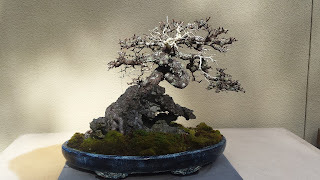 These compositions broke out of the mold of bonsai's tradition and tickled me for that alone because I do not consider myself to have been well entrenched in Japanese tradition in my bonsai history and thus it is easy for me to be open to these unorthodox presentations. 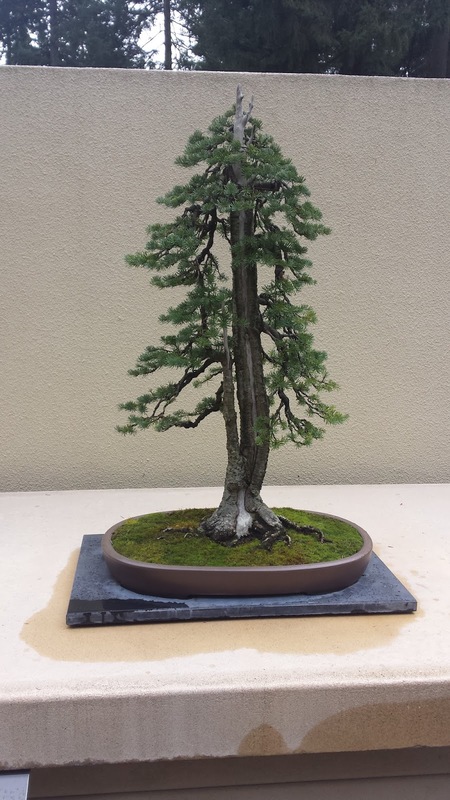 However, for those who have been practicing and showing trees for far longer may have different opinions. 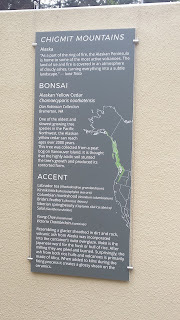 I know for my teacher, Dan Robinson, the three-point display is a formality to him. 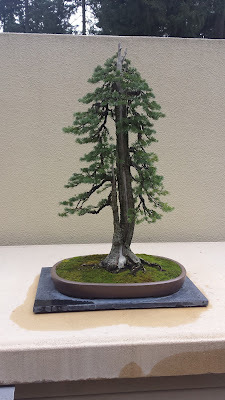 He prefers to focus on giving the tree a story in its own right rather than using outside components to paint a story. 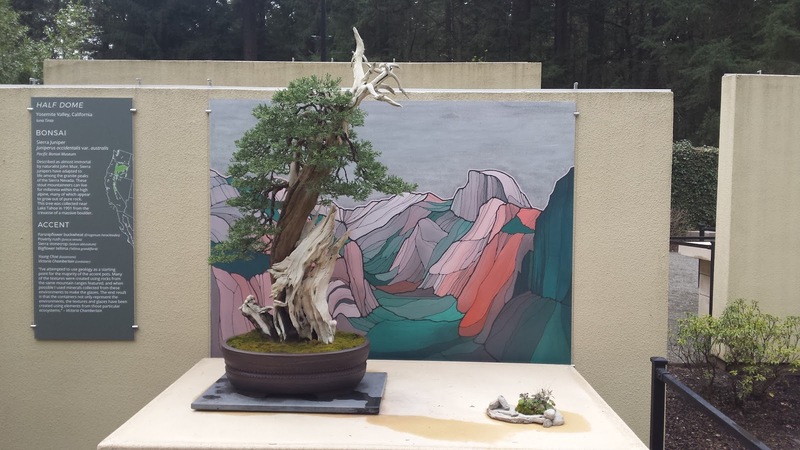 My personal opinion is that in some cases the paintings overpowered the trees or the bonsai and painting were competing for the attention of the viewer's eye. 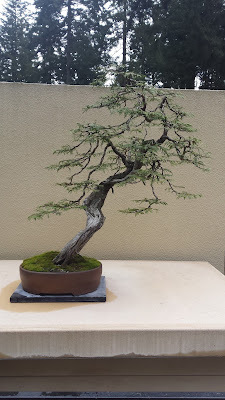 In particular, when I look at the bald cypress scene, I can see why the Japanese tradition in a three-point display have a rule not to repeat yourself - the redundancy of having the bonsai trees with the backdrop of more bald cypress did not present as pleasing a composition to me as some of the others. 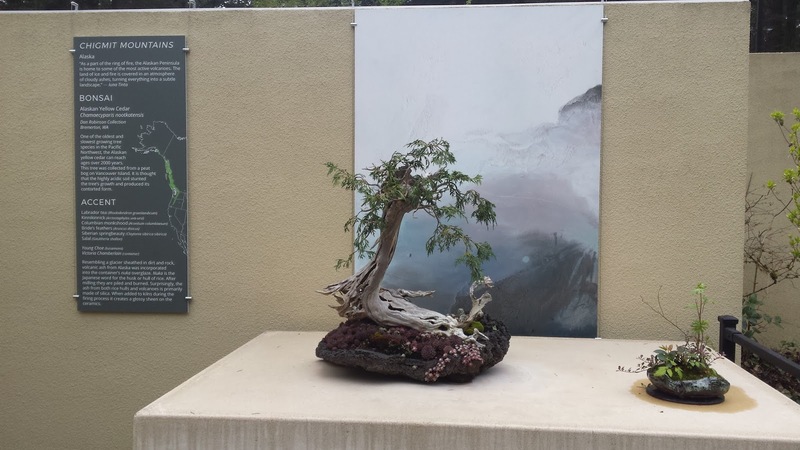 In particular, I felt the compositions of paintings and accent plantings complimented the Staghorn Sumac (last tree) the most. I hope to see bonsai artists continue to experiment outside of tradition in all aspects. 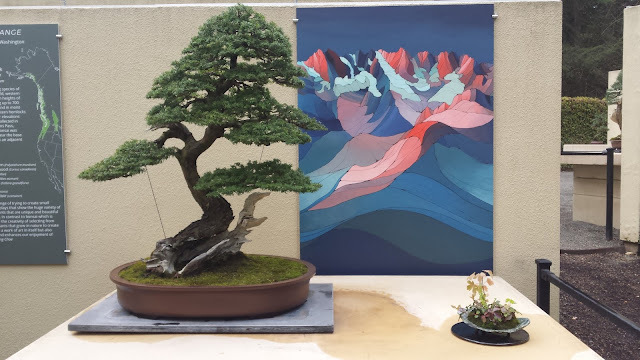 As a scientist, I am aware not every experiment works, but new options, methods, or knowledge are all worth exploring to me - even in the ancient art of bonsai. 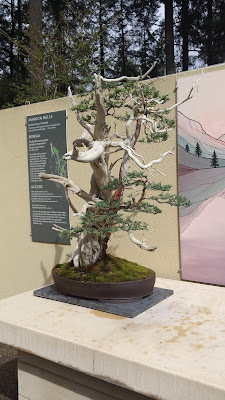 You'll find the comments below, but also some extra photos from the Pacific Bonsai Museum that were not included in the "Natives" exhibit, and all among the museum's permanent collection of bonsai trees (although not always in the display area).